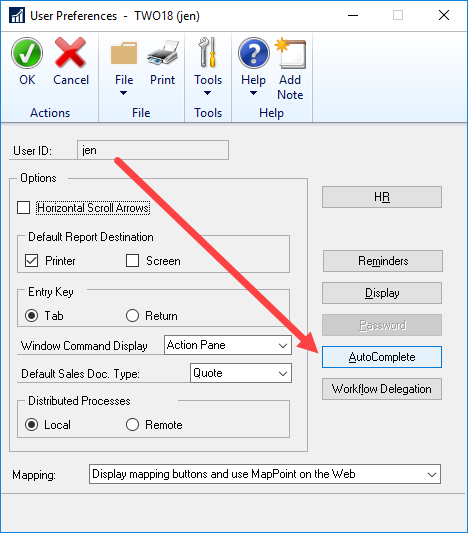 Today’s #TipTuesday post is all about the AutoComplete feature in Dynamics GP. There’s not a lot to this but at the same time, there are a few tips I can pass along that you may not have known about! AutoComplete is the feature where a drop down list appears in certain fields in Dynamics GP, allowing a user to more quickly complete data entry using recently used information. The example below is on a vendor card. This AutoComplete list would appear on any instance of the Vendor ID field in Dynamics GP, whether that is a transaction or a card or an inquiry window. Generally speaking, AutoComplete is only available on “ID” fields. Sometimes where ISV (Third Party products) are involved, it may not always be present where you expect it to be! (And this contradicts what I said above, as some ISV products may not recognize or utilize AutoComplete and thus there could be a Vendor ID field tied into that ISV product where this list would not appear). Here’s the good part: you can right click on it and select Remove From List to remove it. Easy peasy! It will then disappear from the “Vendor ID” AutoComplete list forever, until you mis-type it again some day! Removing AutoComplete entries – all of them! There is another option if you want to simply clear the entire AutoComplete list for yourself (speaking as an individual user): it’s an option in User Preferences. First, open the User Preferences window (by default this is on the Home page shortcut bar or under the Dynamics GP menu). Next, click on AutoComplete (a button on the right hand side as shown above). To remove all of *your* entries (just for your UserID), click on Remove Entries. As you can see in the screenshot above, there are a few more options that you can manage in the User Preferences > AutoComplete Setup window. A user can turn off AutoComplete entirely. Some users really hate the drop down list thing and find it gets in the way. This is an option for those users! 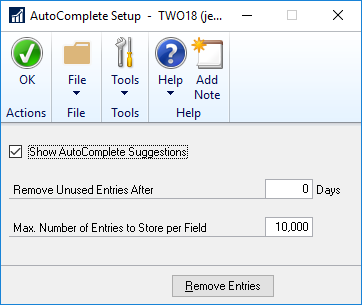 Setting a number of days after which unused entries will be removed. By default the days is 0 which is unlimited, meaning the AutoComplete list on a given field will stay there forever! Setting a limit on how many AutoComplete entries a user wants to remember, per field. The default here is 10,000 and I’ve seen some users trim it down to a more manageable number. FYI: In GP 2018 they added autocomplete to the web client. However, when you turn off autocomplete in the user preferences it does not turn it off in the web client, only full client. Very interesting fact about the setting not impacting the web client. Thanks for your comment! I may have spoke too soon. It might actually turn off (if you turn it off in the full client or modify the SQL table) but still remembers what was previously entered and continues to bring those up. Currently have a case open with MS about it, but just something to be mindful of. Need to do more testing, might be a folder on the session server that needs deleted before it can truly be turned off. I hope that makes sense, haha. I’m running GP 2016 at work so I can’t test it out unfortunately. I’ll ask some peers to get a larger sample size!